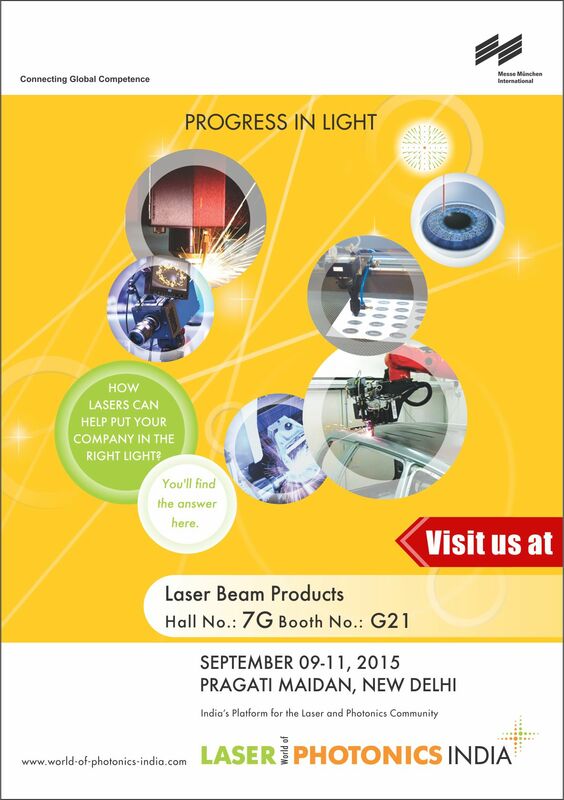 We’re busy preparing for the next Laser World of Photonics show in India. We were impressed with the show last year in Bangalore so we’re hoping it will be just as good this year in New Delhi. If you’re visiting come and visit us in the UK pavillion, Booth number G21. We’ll be showing a range of our products including gold coated copper and aluminium mirrors with a range of optical coatings and sizes from as small as 5mm diameter. Resistant to harsh environments our mirrors have high laser damage thresholds and are used in many applications including gas sensing, medical and dental lasers, fiber lasers, high power pulsed and CO2 laser cutting and infra red counter measures. LBP manufacture a wide range of standard and bespoke parts with a range of optical coatings covering the spectrum from UV to THz as well as infrared. Full details are available on our website. We will be in Munich again this year showcasing our range of all-metal mirrors for science and research, as well as our now well-established mirror reworking service. We’ll be showing a wide range of our mirrors including Gold coated Copper, Aluminium, Molybdenum, Stainless Steel and Tungsten. Most of these materials have excellent broad reflectivity across the mid infra red, and are ideal for many infra red applications. They are highly durable and resistant to harsh environments such as those found in gas sensing and infrared spectroscopy. With an excellent range of reflective coatings covering the spectrum from UV to THz, we have an unrivalled range of products which can be seen, and handled, at this years show. 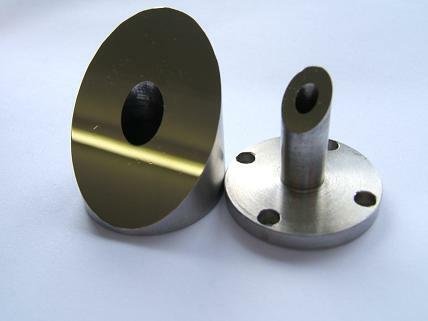 Suitable for CO2 laser cutting and welding, fiber laser applications, Dental and Medical Er:YAG lasers, QCL sources, fiber lasers and even Terahertz applications our mirrors are regularly supplied for both low volume prototype and high volume production parts. Customers include industrial laser users, OEMs, Academics and Research Institutes around the world. LBP’s customers worldwide are also regularly saving thousands by repairing mirrors back to operational condition after damage by exposure to chemicals and harsh environments. Examples of ‘before’ and ‘after’ mirrors will be on display. We had a good opportunity to compare the performance of our gold coated copper mirrors with uncoated copper mirrors recently. A customer sent us dozens of large water cooled mirrors from his 6KW CO2 laser to re-manufacture. The workplace environment of the laser cutting system had dulled and corroded the bare copper mirror surfaces. Simply handling the mirrors had caused stains on the mirror face. 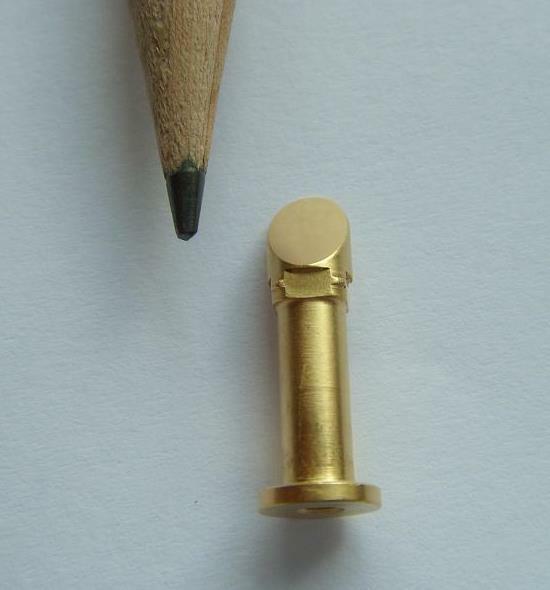 In comparison a gold coated mirror, from exactly the same laser, had barely changed it’s appearance, or performance. 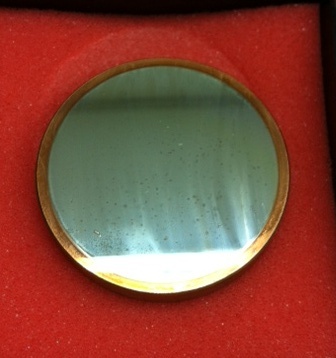 Uncoated Copper laser mirrors or Gold coated ? 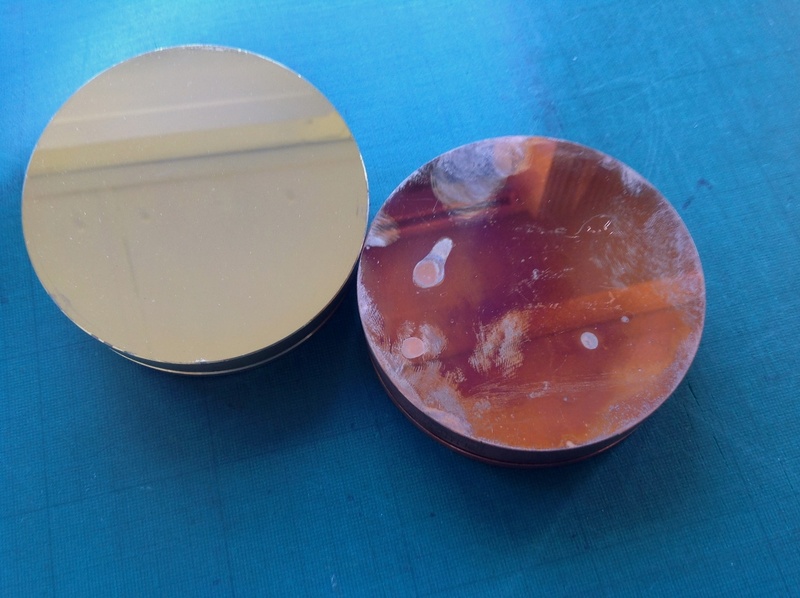 We’ve also recently helped customers in tropical climates who had problems with copper mirrors corroding, even in storage. Moisture reacts with exposed copper to cause pitting and staining, and even penetrates through pinholes in dielectric coatings. Several OEMs are now specifying mirrors should be Electroless Nickel plated, so no part of the mirror is exposed copper. This is already the case with all of LBP Copper mirrors. Copper can also diffuse into metal mirror coatings deposited on it; to prevent this a diffusion barrier such as Electroless Nickel should be used. Some of our competitors are now warning that copper mirrors should be kept absolutely dry, which is simply impossible if they are to be used. Especially as most of them are water cooled! We seem to have had a bit of a surge in demand for diagonal, or elliptical flat mirrors recently. We have just made some diagonal mirrors from gold coated copper with a diagonal angle of 60 degrees. When viewed at 60 degrees they have a circular profile. We have also made similar all metal mirrors from Stainless Steel for Laser Induced Breakdown Spectroscopy. Stainless Steel is generally used uncoated. 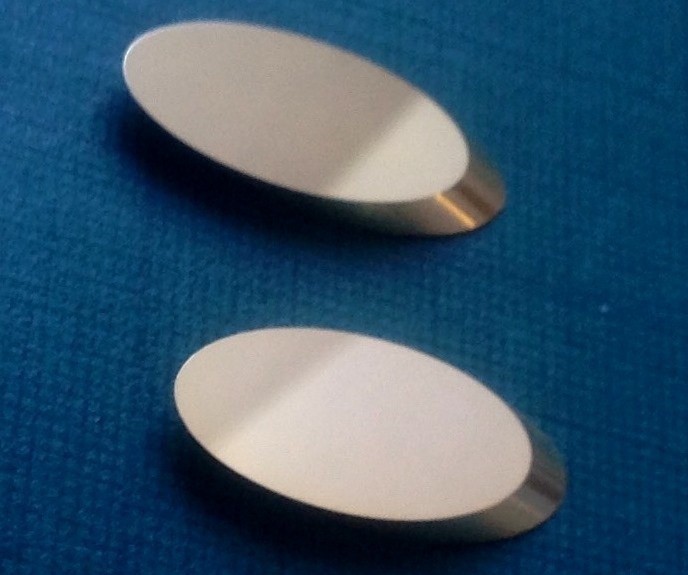 Last, but not least as it is a great application for our laser mirrors, some small gold coated copper mirrors for Er:YAG surgical laser handpieces. With surgical lasers, left-handed surgeons can have great difficulty using surgical equipment designed for right-handed surgeons, or when being trained by right-handed instructors. With lasers at least, it’s possible to use a mirror to “flip” the beam paths and allow right handed and left handed use. The first diagonal metal mirror was probably made by Isaac Newton in 1668, juts a few miles from our factory here near Cambridge. It was the secondary mirror in the worlds first telescope to use reflective optics. The Gold coating also has consistent reflectivity from face to face for multi faceted mirrors, reducing variations in power during scanning. No tooling or batch charges are made for our Gold coating, even when coating a single mirror. We offer Gold coating on mirrors made from Copper, Aluminium, Nickel, Brass, Beryllium/Copper, Stainless Steel and other metals and alloys.